Brushing teeth aggressively. Yes, this is contrary to the previous cause which says if you don’t brush properly, you may get receding gums. In fact, if you brush your teeth aggressively, then also you may get receding gums. This is because such an aggressive act wears away the enamel present on your teeth. This, in turn, makes the gums recede. Heredity is also a cause sometimes. If your genes are the cause of your receding gums, there is very little you can do to prevent it. Smoking not only causes various diseases including cancer and lung diseases but also receding gums. Those who consume tobacco in any form are prone to have a sticky plaque on their teeth. This leads to gum recession. Misuse of teeth in form of grinding and clenching teeth put pressure on the teeth which leads the gums to recede. Similar force when putting on teeth, for example during taking bites while eating may lead to receding gums. This happens when you have crooked teeth and when they do not come together evenly while eating. Piercing of your lips or tongue can also cause gum recession. This is because the jewellery that you wear after piercing may get rubbed against the gums. This may lead the gum tissue to wear away. When you notice your receding gums in time, a dentist may treat it with deep cleaning processes used for teeth such as tooth scaling and root planing. In these, the dentist will carefully remove the plaque and tartar that builds up on your teeth and root surfaces below the gum line. If however, you have got late in identifying your receding gums, the dentist may go for gum surgery to repair the damage caused by your receding gums. These surgeries may include such procedures as pocket depth reduction, regeneration of lost bone and tissue of teeth and gums, soft tissue graft etc. However, if you do not want to go for these dental treatments, you may very well adopt certain home remedies that may treat your receding gums. But if your gums have some infection, you must first visit a dentist so that you may know how deep the bacteria have invaded. Sometimes you may need to take help of dentists, particular if your gum recession is at an advanced stage. Otherwise, home remedies for receding gums are sufficient. You can even grow back receding gums with proper dental care and certain natural remedies. Gums are nothing else but soft tissues that cover the bones supporting your teeth so that they may remain in place. These tissues also cover the roots of your teeth. Due to many causes discussed above the gums recede to expose your teeth and its root. Proper dental hygiene, diet and certain home remedies like oil pulling can help your receding gums grow back. We will discuss such remedies in the coming sections of this article. Here are certain remedies that use simple kitchen ingredients and sometimes herbs and spices etc. To treat and grow back your receding gums. 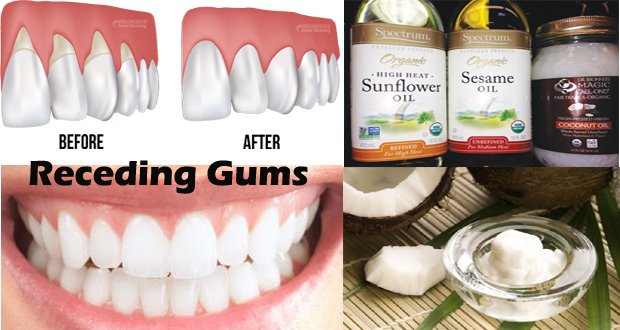 Oil pulling is one of the most effective traditional treatments for various oral diseases. Especially famous for healing cavities, oil pulling can even prevent and reverse receding gums. The anti-inflammatory and many other properties of sesame oil help remove toxic elements from your mouth along with reducing plaque buildup. As mentioned earlier too, plaque buildup may contribute to receding gums in a major way. Sesame oil provides a protective coating over your teeth that prevent plaque from building there. Ayurveda recommends oil pulling not only for curing many oral diseases but also for better absorption of nutrients in your body. Warm the sesame oil a little. Never make it hot, just warm it a little. After brushing your teeth, take the sesame oil into your mouth. Swirl and swish this oil all around your mouth for several minutes. Try to reach a point where you are able to pull oil for about 15-20 minutes at a time. Coconut oil has excellent antimicrobial properties and thus you may rest assured that it will immensely help you in preventing and treating any infection that is present in your mouth. As you now know that bacteria and other oral infections too cause gum recession, coconut oil can be a good remedy to combat it. Not only does it prevent tooth decay and heal a cavity, coconut oil pulling is capable of treating almost all the gum issues including receding gums. After brushing your teeth every day, use some coconut oil as a mouthwash. Take coconut oil in your mouth and swirl and swish it around your mouth. Do this initially for 1-2 minutes and keep on increasing the time as you get used to oil pulling. If you want to treat all your oral diseases and keep your mouth protected from any future disease, pull coconut oil in your mouth for about 15-20 minutes daily. This may also grow back your receding gums. The essential oils have all the essential properties of the herbs they are made up of. In fact, their strength is much more than the actual herbs. That’s why only a couple of drops of essential oils are enough to cure a condition like a eucalyptus oil that cures receding gums. It is an effective germicide and thus kills all the germs in your mouth to protect you from oral diseases that lead to gum recession. Due to its anti-inflammatory properties, it also reduces the swelling in your gums. However, never apply it undiluted as it is too strong for the soft tissue of your gums. Add the eucalyptus oil to the water and mix well. Now dip your fingers or toothbrush (having soft bristles) in this diluted oil. Not only will this cure and prevent gum recession but will also stimulate the growth of new gum tissue. This resin obtained from the Myrrh tree has been traditionally used for treating many gum diseases and the diseases of the mouth. It not only stops gum recession but also prevents further damage to your gums. Take some myrrh and if it is not powdered one and is in the form of resin, crush it to get its powder. Mix some water to this myrrh powder. Now massage your gums with this myrrh paste for few minutes. You may also use a toothbrush for the purpose. Clove oil has long been used for oral diseases, particularly for a toothache. But did you know that clove has excellent disinfectant properties! Its fine anti-bacterial properties help keep your mouth germ free which is a prerequisite to treat any oral disease. This oil also has anti-inflammatory properties and thus reduces any swelling in your gums. It is very important to reduce inflammation if you want to treat periodontal diseases. Whenever you chew a clove, you will feel the numbing effect inside your mouth. This is also a very good way to use clove for any oral disease. After meals, chew a clove and make sure its contents (read oil) reach all the corners of your mouth. This also removes any bad smell that comes from your mouth. Alternatively, you may try using clove oil. Apply clove oil to your gums. Now massage gently for few minutes. Precaution: If you are on blood clotting medication, consult your doctor before using clove oil. The mild anti-bacterial and antiseptic properties of lemon come handy when it comes to keeping your mouth germ free. In fact, it is also a good remedy for growing back receding gums as it stimulates the growth of new gum tissue. The refreshing smell of lemon keeps all bad breath away too. However, because lemon is acidic in nature, its regular use may damage the enamel of your teeth. Therefore it is recommended to use lemon oil only once a week and not daily. Instead of using the very strong lemon essential oil, try making your own lemon oil at home so that you are saved from the damaging effects it has on your tooth enamel. Shake it once every day. After a few weeks, maybe 3-4 weeks, start using this lemon oil. Prevention is always better than cure, goes the old saying. Looking at the increasing instance of receding gums in more and more people, it seems useful to take precaution and start taking care of your oral health. This not only prevents receding gums but other oral diseases too. But how to take proper care of your gums and teeth so that you are saved against periodontal diseases. Here are some tips for the same, for preventing gum recession and for proper oral care. You should take proper care of your mouth to not only prevent gum recession but also to prevent any other kind of oral disease. Whenever brushing, do it with gentle strokes and in a circular motion. Never push your gums upwards while brushing. Brush them along your gum lines. Don’t use too large a toothbrush. A brush having a small head and soft bristle is ideal for your mouth. Don’t forget to floss as it is essential for removing plaque. The ideal condition is to brush and floss after every meal. If, however, it is not possible every time, at least rinse your mouth properly with water after meals. Using mouthwash every day keeps germs away from your oral cavity. As you now know that infection is the most common cause of receding gums, you should use mouthwash daily. While you can always buy a germicidal mouthwash from a market if you want to go all natural, make your own natural mouthwash using certain essential oils. Take 1/4 -1/2 cup of water and add 1-2 drops of such essential oils as tea tree oil, peppermint, clove, or sage oil. Now wash your mouth with this natural mouthwash at least for a minute swirling it all around inside your mouth. Hydrogen peroxide is yet another safe way to keep your mouth protected from infection. But never use it alone. Always dilute its small amount with water and then wash your mouth with it. If possible, use mouthwash after every meal. If not, at least use it twice, once in the morning and once when you go to bed at night. This is essential for your overall health. If you didn’t know that drinking lots of water can even keep your gums healthy, be aware of it that it does so. Here are some reasons why water helps prevent receding gums. When you drink lots of water, all the toxins get flushed off your body and this includes your mouth too. This prevents your mouth from getting any bacterial infection and thus there is no gum recession. Water also cleans your mouth. Ideally, you should clean your mouth after you eat anything. If however, sometimes you don’t do this, whenever you drink water, the food particles stuck in your mouth get cleaned away and you swallow them with the water. Always try to at least swish around some water in your mouth if you can’t rinse it. It is never a bad idea to swallow this water (if you cannot throw it away) to make the food particles present in the mouth go into the stomach where it can be digested or discarded as waste material. healthy foods not only keep your overall health intact but also boost your immunity so that you do not catch any infection. Junk foods, on the other hand, give bacteria and other microbes enough opportunity to grow and thrive in your mouth leading to infection and finally gum recession. Eat lots of fruits and vegetables, especially those that contain nutrients like vitamin C. This vitamin is vital for the health of your gums. Vitamin C reduces inflammation of gums, prevents oral diseases and promotes gum regeneration. So, have lots of strawberries, pineapple, oranges, and vegetables like broccoli, cauliflower, asparagus etc. Avoid having sugary foods and beverages like cold drinks. They are ideal for the growth of bacteria. Also avoid processed foods, caffeine, alcohol, and foods made from white flour. They are not good for your oral health, not even for your general health. Yes, deficiency of many vital nutrients in your body is also responsible for poor oral health and receding gums. Go to your doctor and find out through his recommended tests whether you lack any vitamin or other essential nutrients. If yes, ask him to prescribe them for you. Here are certain supplements that may help you in preventing gum recession. Ginkgo biloba- it improves blood circulation which is essential for healthy gums. Vitamin C- it is anti-inflammatory and also boosts your immunity so that you are protected against infections. Coenzyme Q10- It promotes cell renewal. Therefore, it can help grow back the receding gums. Zinc- It enhances immunity. A strong immunity means you do not catch any infection easily and thus you are protected against the oral diseases too. This will keep your gums healthy and you will not face the problem of receding gums. Where I can buy this sunflower oil,for receding gums? I also use Silver Biotics which is good for the treatment of gum diseease. It is a bit expensive but it worked. It's about $50 a bottle for the large bottle. Thank you for your help. You get reward from God when you help people. What brand did you use and did u delite it with water or pure peroxide? Hey dude I'd like to know more as well, thanks. I'm drinking green tea, does this regenerate the tissue? Savannah L Michaels Same here. I used extra virgin coconut oil for about a week, for about 15 to 20 minutes each day. My gums are much worse, and I can almost see the roots of my teeth. They're also very sensitive to any kind of food or drink, hot or cold. Sometimes I can't even sleep at night. Extremely helpful home remedies and one should select his own oil and use it one daily basis. I'm drinking green tee but seem to damage my nails wath can I do?my gums are recciding a lot,can I use tea tree oil, clove, sage pepper mint all together to rinse my mouth? The title of this article suggests you can regrow your receding gum line but all the suggestions only prevent…..where are the remedies to regrow? Receded gums can't grow back. Only gum drafting can help.